It seems we’re always being told to stay neutral in our color schemes. Why is that? Do designers just want us to be boring and safe so they can have all the fun in their own homes? Hardly. The truth of the matter is, neutral doesn’t have to mean “boring,” and there are plenty of reasons that point to neutral being the smarter option. I hate to state the obvious, but for the sake of being thorough, here goes. If you’re selling your home, neutral is a safer choice than other color schemes. Although it’s possible, chances are the person viewing your home will not care for your red refrigerator in quite the same fashion you do. If you’re planning to sell your home at some point, you’d be better off going with stainless steel, black or white. Same goes for those funky countertop and cabinet colors. It’s tempting, but could cost you money down the road. As much as you want to believe you will love your choice in 10 more years, think about the things you loved 10 years ago. In fact, those may be the current choices in your kitchen that you’re trying to replace…and chances are, you got sick of them years ago. Take a moment to think through the decades, and reflect on the choices you’ve made (or didn’t make). Of course, there are more options available in today’s world, but just because they make a teal fridge, doesn’t mean it’s the right choice. You may be feeling adventurous, but please think long-term availability. Color popularity changes from year to year, and although you may be 110% sure you’ll never stop loving a color, the manufacturer may not feel the same way. A few years down the road, your appliances, countertop or paint colors may become discontinued. So, if one of your pieces gets damaged and there are no exact replacements, you may be stuck with a mismatched kitchen – or a large replacement bill. There are plenty of ways to make a neutral kitchen appear bold and daring without including permanent long-term commitments. Add some fun color pops that you’ll be able to change the moment they start to irk your senses. Think anything easily removable: hand towels, vases, dinnerware, artwork, curtains, etc. Even painting the walls is a safe – changeable option. By incorporating style through accessories, you’re minimizing your chances of developing a future kitchen headache. 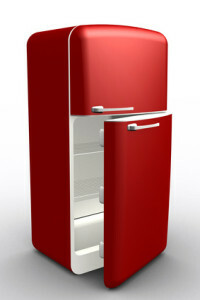 There are so many ways to bring style into your home – is a bright fridge really your best option?